Uncle Scrooge sends Donald and the nephews to the jungle; the nephews solve a Western ghost mystery; and there are 10,000 hungry baby turkeys to deliver. 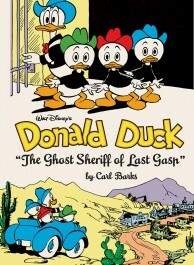 Donald and his nephews visit an Old West ghost town that was suddenly abandoned when the sheriff vanished while in hot pursuit of a passel of outlaws. Now the remains of the town are haunted ― and it’s up to the plucky nephews to solve the mystery of “The Ghost Sheriff of Last Gasp” before it’s too late! Then, Donald is made stationmaster for a tiny out-of-the-way railroad station, but his first delivery is 10,000 baby turkeys ― and they’re all hungry! And when the Coast Guard announces it found the wreck of a steamship that sank with Uncle Scrooge’s gold on board, the race is on to recover it ahead of Scrooge’s rivals. Scrooge hustles Donald and the nephews into his private submarine ― but it’s Christmas Eve, and the boys are afraid Santa won’t be able to find them to deliver their presents. The boys appeal to Uncle Scrooge, but ― well, his name is Scrooge.Plus lots more stories with Barks favorites, including the wacky inventor Gyro Gearloose, the irritatingly lucky Gladstone Gander, and the ever-glamorous and sensible Daisy Duck. 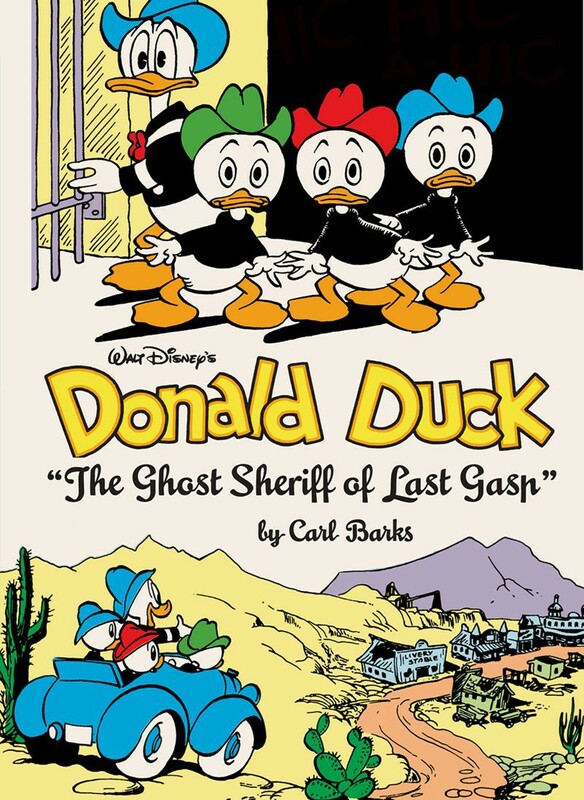 Carl Barks delivers another superb collection of outrageous hijinks, preposterous situations, and all-around cartooning brilliance. Over 200 pages of stories, each meticulously restored and newly colored. Insightful story notes by an international panel of Barks experts. Full-color illustrations throughout.